Well! I’ve certainly neglected this little blog recently. I have been busy interviewing potential vendors so we can finally book the remaining ones we need. We still need an officiant and a DJ – two major ones! – so I’m hoping to lock that down within the next week, and I’ve interviewed some amazing florists. It’s going to be hard to decide which one we’ll go with because I love each of their visions! Where I last left off, I had just found my dress! I finally made a decision on what type of shoes I’m going to wear so tomorrow we’ll finally order it! Next up is to start the bridesmaid dress shopping. I made an appointment to go with my Maid and Matron of Honor and I’m so excited! I’m still torn between gray and black, but have been gravitating more to black in the past week or so. But, I’m keeping an open mind and going to find the dress first, then decide the color. Other than that, we have our engagement photos on April 6. We finally decided on a location, so now I just need to figure out wardrobe! So hard – I have no idea what to wear, or what look I’m going for. So I’m definitely going to be googling examples and hitting the stores. I’m also working on our wedding website, which is coming along. I need that as complete as possible in time for our save the dates to go out, which I’m also currently shopping around for. So, I’ll definitely have lots of topics to blog about in the next 2-3 weeks! In the meantime, I thought I’d post a delicious recipe I found on Dr. Oz’s Pinterest. I was quickly browsing through and found a “90 Second Greek Omelet” recipe and realized we had all of the ingredients, and I was about to make breakfast! It’s a great, healthy meal when you’re on the go so I definitely plan to try the microwave version when I’m in a rush sometime. Spray cooking spray in microwave safe bowl. Scramble egg in bowl and add remaining ingredients. Microwave on high for 60 seconds. Remove from microwave and enjoy! Variation: Try mixing it up by making it Mexican with corn or Italian with some mozzarella cheese and fresh basil. I basically followed the original ingredients, but didn’t chop my spinach, and subbed mushrooms for tomatoes because I had them chopped on hand. 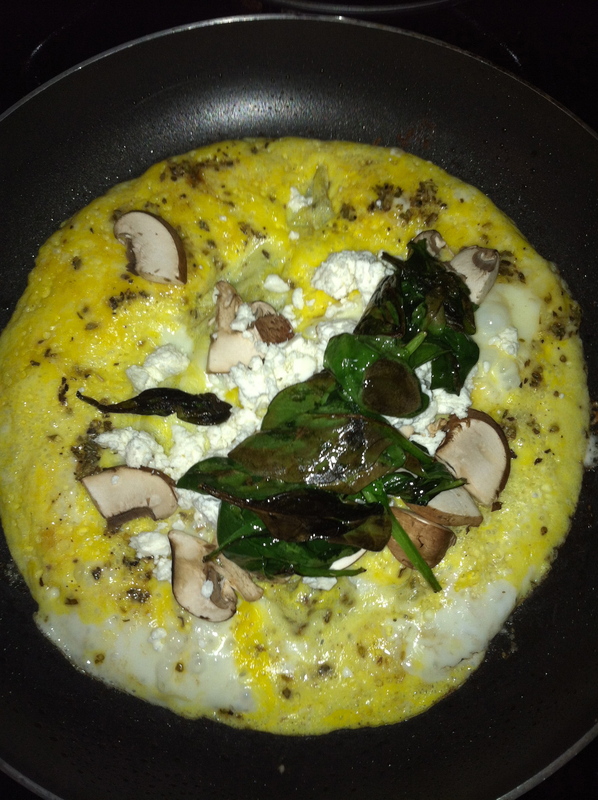 I cooked the spinach in olive oil while mixing the eggs with some salt, pepper and plenty of oregano. 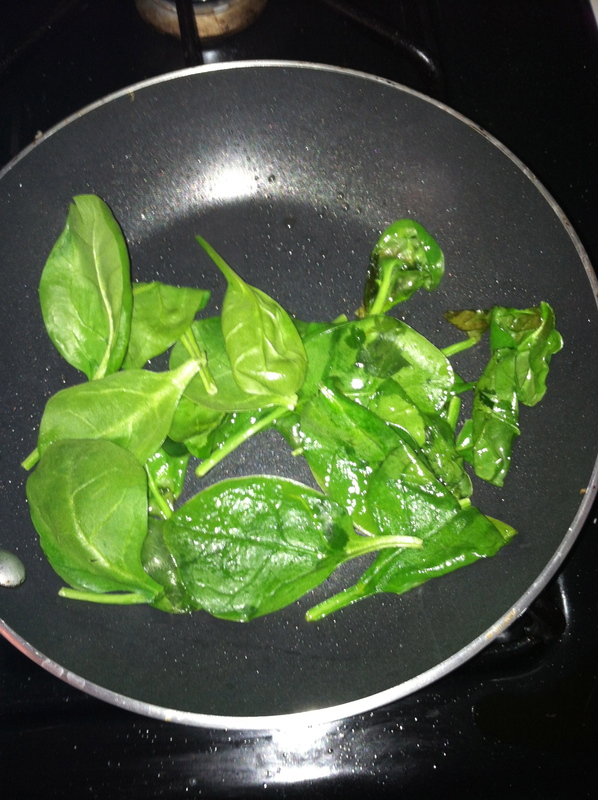 In a separate pan I poured in the eggs, and let them set while the spinach finished cooking. Once both were done I poured on the mushrooms, crumbled feta, and cooked spinach. 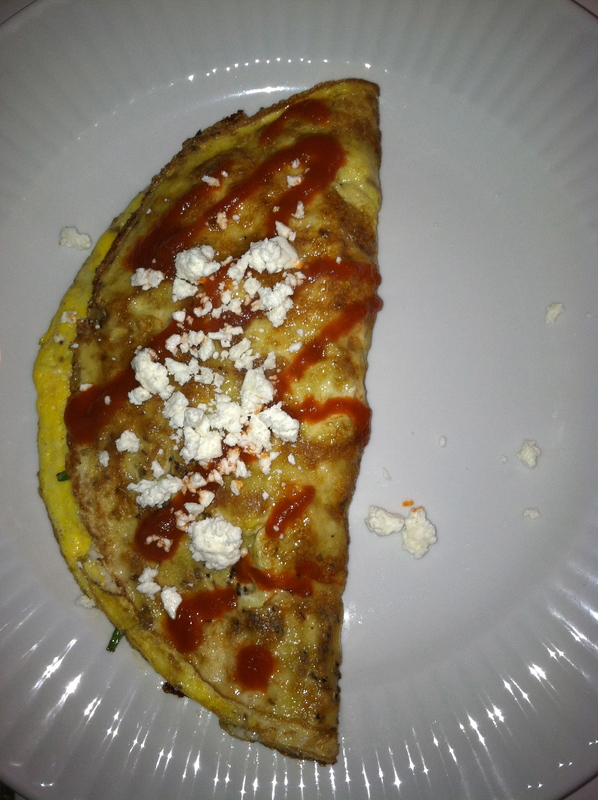 I “closed” the omelet and let it set once more, then served with more feta on top and Sriracha Chili Sauce. It was delicious and definitely a quick, healthy, easy recipe I’ll try in the future! My fiance asked why I never cook it for him, so maybe I’ll have to treat him to one this weekend! 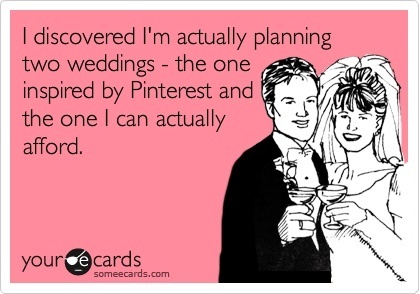 I found this Some E-card the other day on Pinterest and about died. How true is that in my case? Speaking of Pinterest & Dream Weddings, I entered a contest sponsored by My Gatsby, a stationary website. The prize is $200 towards your wedding stationary and all you had to do to enter was build a board on Pinterest showcasing your “Dream Wedding” vision. Uhh, haven’t I already been doing that since I joined Pinterest two years ago? Hello – count me in! So, yesterday, with my newfound wedding vision, I gathered all of my favorite pins covering stationary, hair, jewelry, attire, flowers, centerpieces and lighting on this pin board. I can only imagine how many amazing boards were entered into the contest but I really want to win! Lifestyle blog sharing my views and experiences as a newlywed, Pinterest junkie, avid follower of politics, chronic dieter and wanna-be Bob Vila. Enjoys San Diego beer, burritos, beaches and sports teams. My big journey to live tiny. Sweet and snarky. Because you can be both. Trust me.